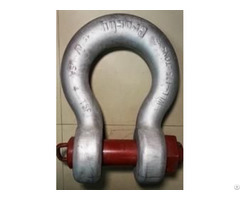 capacities from 8-1/2 t through 55 t.
crosby g209 rp subsea shackles are forged steel, quenched & tempered, with alloy pins. two styles of interchangeable handles, “d” and “f” that are stainless steel. 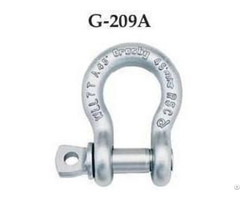 working load limit permanently shown on every crosby g209 rp subsea shackles. quic-check deformation and angle indicators forged on the bow of crosby g209 rp subsea shackles. all crosby g209 rp subsea shackles are galvanized, then painted fluorescent yellow. 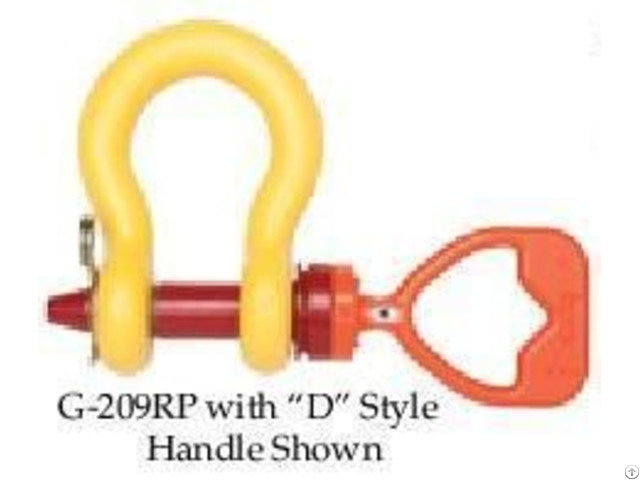 handles of crosby g209 rp subsea shackles are are painted fluorescent orange. pins are galvanized then painted red. interchangeable handles on rov shackle pins available as assembly kits. “d” and “f” handle kits available containing handle, retaining bolts and thread locking compound for easy installation.